Hocknulls Phurnacite Smokeless Fuel Isle of Wight. A premium smokeless fuel for cookers, room heaters and multi-fuel stoves. 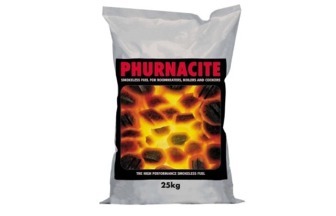 Phurnacite is a hard clean briquette with a unique double groove; it gives long lasting consistent and controllable heat. It burns slowly and can give excellent heat output for up to 18 hours. Suitable for Cookers, Room Heaters and Multi-Fuel Stoves.